The Government has admitted that the United Kingdom (UK) has received a Letter of Formal Notice (first written warning) from the European Commission (the Commission) for failing to meet its legal obligations in relation to Air Quality. The admission came in a response to a Freedom of Information request submitted by the Campaign for Clean Air in London which has written again to the European Commission to urge further action. Both letters appear below. While the Government’s response omits important details, the Campaign for Clean Air in London has uncovered further key details after the intervention of one of London’s leading MEPs John Bowis. Conservative Mr Bowis MEP was able to obtain independent confirmation that the Letter of Formal Notice was in respect of Sulphur Dioxide legal breaches and was decided by the Commission on 27 June and sent out to the UK on 29 June. In response to an information request to the Commission, the Campaign for Clean Air in London found subsequently that the Letter of Formal Notice (Reference 2007/2184) on exceedances of hourly and daily limit values for Sulphur Dioxide (SO2), in so-called UK0029 air quality zone “Eastern”, was sent by Commissioner Dimas for the Commission on 29 June 2007 to the Secretary of State for Foreign and Commonwealth Affairs. The response, with UK observations to the Commission’s view that UK has failed to fulfil its obligations of Article 3(1) and Section I of Annex I of Air Quality Directive 1999/30/EC, was due to be received by the Commission within two months of receipt. The UK was one of only five countries in the whole European Union (EU) to receive such a letter: the others being France, Italy, Spain and Slovenia. The Campaign for Clean Air in London had already received a letter from the Commission confirming its investigations into breaches of EU limit values generally which was published on the BBC Action Network on 12 August 2007. The two month deadline for replying to the Letter of Formal Notice passed last week after which the Commission can issue a “Reasoned Opinion” (final written warning) before considering involving the European Court of Justice two months later. 6. “Maintain the Commission’s tough stance on the content of the proposed new Air Quality Directive to achieve better protection for Europe’s citizens. Accept, only if it looks as though MEPs from some countries may seek to weaken the new regime for everyone, very regrettably, that we may be better with the current, muddled, Air Quality regime of many Directives than a weakened new regime. “Air pollution has a major health and environmental impact in our city: it is responsible for the death of 1,000 people in London each year and it shortens lives by an average of eight months. Respiratory and cardiovascular side-effects lead to increased hospital admissions, extra medication, millions of lost working days each year and hundreds of thousands of premature deaths. “I welcome the work that the Campaign for Clean Air in London has done in exposing the Government’s negligence in not tackling unacceptable levels of sulphur dioxide in the UK’s streets. The UK is one of only five EU Member States to receive such a warning. We should be leading the way in environmental standards across Europe, not forever playing catch up. “DEFRA’s reluctance to act in an open manner raises important questions about the integrity and value of the UK Government’s air quality strategy. There is an apparent failure to take seriously the commitments in that strategy and to respect EU legally binding pollution limits, on top of this refusal to be transparent. Well done to the laudable Campaign for Clean Air in London for digging out the truth in typically dogged fashion! As an MEP I am very grateful for its briefings and calls to arms. “It is pretty shameful that the EU has had to launch action against the UK for breaching sulphur dioxide (SO2) emission limits in Eastern England. London’s record on air quality is no better, and unacceptable given its position as a world city, and that is why Liberal Democrats wanted the Low Emission Zone scheme to be strengthened. Thank goodness the European Commission is setting an example with SO2. However, in order to ensure the health of Londoners, we encourage it to go further and force the Government to address the diesel- produced fine particles that are so damaging to lungs. We have many such “hotspots”, not only in central London, but also in busy outer London locations where those readings are too high. “We welcome the Government’s disclosure of the European Commission’s intervention in respect of Air Quality breaches of legal requirements. However, we are dismayed by the Government’s continuing lack of transparency and action in the area of Air Quality. “We have needed John Bowis MEP, fighting for London, to find out separately when the Letter of Formal was sent to the UK and in respect of which legal breaches of Air Quality. This is not good enough when it follows quickly publication of the Government’s new Air Quality Strategy which itself demonstrated a lack of political will. “Do the 4,000 people seemingly exposed to unhealthy levels of sulphur dioxide in UK0029 air quality zone “Eastern” in England, perhaps in the vicinity of one industrial plant, know that the European Commission has had to take action to protect them? For details, please see pages 71 to 73 of Volume 2 of the new Air Quality Strategy published by the Department for Environment, Food and Rural Affairs (Defra) on 17 July 2007. “With Particulate Matter and Sulphur Dioxide EU legal limits both due to have been met throughout the UK by January 2005, with no time extensions or derogations, we have written again to Commissioner Dimas asking him to publicise the European Commission’s enforcement actions, to accelerate action on Sulphur Dioxide and to take formal enforcement action against the UK, at least in respect of London as a specific location, for its breaches of EU legal limits for Particulate Matter in 2005 (and subsequently 2006). “We wish to thank John Bowis, Chris Huhne, Jenny Jones and Baroness Ludford particularly for their latest support of our Campaign and the European Commission for its transparency and positive action as we head towards the European Parliament’s Environment Committee meeting scheduled for 9 October and the crucial second reading of Europe’s proposed new Air Quality Directive due on 10 December. 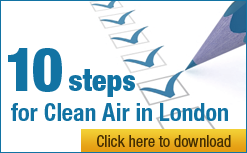 “We wish to thank too Mayor Livingstone, Deputy Mayor Nicky Gavron and Len Duvall for their support of our Campaign and encourage them to build boldly upon their current and proposed Air Quality initiatives, to lead pressure on the Government on London’s behalf to play its part finally and to deliver sustainably clean air standards throughout London by no later by than the London 2012 Summer Olympics. “We encourage the Government to begin rebuilding its credibility on Air Quality by producing credible plans, to the European Commission’s satisfaction, to meet all of the EU’s Air Quality requirements sustainably throughout London by no later than the London 2012 Summer Olympics. Your request has been considered under the Environmental Information Regulations 2004 (S.I. 2004/3391). As you are aware, a Commission request of the type you mention is likely to be made as part of, or in relation to, the formal infraction procedures under Article 226 of the EC Treaty. In so far as your request therefore relates to ongoing infraction proceedings, I confirm that we hold correspondence from the Commission pursuing infraction proceedings against the UK concerning an infringement of the First Air Quality Daughter Directive (1999/30/EC) (reference: infringement No. 2007/2184). This comprises a letter of formal notice. As you are aware, a letter of formal notice is part of the administrative phase of live infraction proceedings. This phase of infraction proceedings can be followed by a judicial phase, should the Commission wish to refer a case to the European Court of Justice. Having considered the correspondence in question, and the context of Article 226 proceedings generally, we are not disclosing this correspondence for the reasons set out in this letter. We have reached our decision on the basis that we consider that the Article 226 correspondence between the UK and the Commission engages the exceptions in regulation 12(5)(a) (which applies where disclosure of information would adversely affect international relations), and in regulation 12(5)(b) (which applies where disclosure of information would adversely affect the course of justice) of the Environmental Information Regulations 2004. This is because the information relates to infraction proceedings which are ongoing. These exceptions are subject to a public interest test. We have considered the balance of public interest under regulation 12(1)(b) (refusal to disclose environmental information if in all the circumstances of the case the public interest in maintaining the exception outweighs the public interest in disclosure). We consider the case for disclosure is transparency and public interest in action by the Commission to seek to enforce compliance with the Air Quality Directives. That said, we are also mindful that information on exceedances of the air quality limit values which could, in principle, trigger Article 226 infractions proceedings, is already available to the public as required by those Directives and the Air Quality Standards Regulations 2007. We consider the case for withholding arises because this information is part of a legal dispute between the Commission and the UK Government. As the investigations and infraction proceedings are ongoing, we consider disclosure at this stage would risk undermining the investigations, conduct, and handling of the case. It is not the practice of the European Commission to release information relating to infraction proceedings on the basis of Article 4.2 of Regulation (EC) 1049/2001, which covers access to documents emanating from Community Institutions. This is because infringement investigations call for genuine cooperation and an atmosphere of mutual trust between the Commission and the Member State concerned, so as to enable the parties to open discussions with a view to a rapid resolution of the dispute, and this would be seriously undermined by subjecting the process to public scrutiny. In the interests of preserving the atmosphere of mutual trust between the Commission and Member States, we consider that the public interest is best served by withholding the information you have requested. This principle has already been recognised by the Information Commissioner, concerning a similar request for correspondence relating to infraction proceedings. In a decision notice dated 18 September 2006 (Reference FS500110720), he accepted that the exemption provided by Section 27 of the Freedom of Information Act 2000 concerning international relations is engaged (that provision reflects regulation 12(5)(a) of the Environmental Information Regulations 2004) and that there was a strong public interest in maintaining the exemption. In his view, disclosure was likely to affect the UK’s ability to negotiate flexibly. I confirm that Defra has not received any other Commission correspondence in the period you specify. I attach an annex giving contact details should you be unhappy with the response you have received. Thank you for asking Marianne Klingbeil to reply to my letter on behalf of the Campaign for Clean Air in London urging you to ask the European Court of Justice to commence enforcement action against the United Kingdom (UK) for breaching European Union (EU) legal limits for Air Quality for which no time extensions or derogations are allowed. I have followed up valuably with Ms Klingbeil and her team on some points. Most importantly, thank you for everything you are doing on many fronts to improve Air Quality for Europe’s citizens. The poor performance of some national Governments in this regard emphasises the importance of your role. Again, we have copied President Barroso since some of the issues raised in this letter may have implications for other portfolios. The Campaign for Clean Air in London submitted a Freedom of Information request to the UK Government to discover that the UK has received a Letter of Formal Notice (first written warning) from the European Commission (the Commission) in respect of breaches of the Air Quality legal limits (attached). We discovered separately, following intervention by John Bowis MEP, that the Letter of Formal Notice relates to sulphur dioxide (SO2) and was decided by the Commission on 27 June and sent out on 29 June (07/2184 (UK)). Ms Klingbeil, in her letter, made clear that the Commission has requested information from Member States on the measures they intend to take to improve the [Air Quality] situation and to meet the requirements of the AQ Directives. This will include particulate matter (PM10) following the breaches in 2005 (and subsequently for 2006). These developments and others in recent weeks show that the Commission is taking a tough approach to Air Quality enforcement, as we had hoped it would, and are therefore most welcome. We are most concerned though that the UK Government is resisting transparency (as can be seen in its letter to us and attached here), may seek unnecessary delays in responding to the Commission’s requests or may seek to persuade the Commission that the UK’s new Air Quality Strategy (AQS) shows how Limit Values will be met for SO2 and PM10. In our view, much greater transparency is needed, delays are unacceptable when so many lives are at stake and – having read many pages within the three volumes – the UK’s AQS shows clearly that Limit Values for SO2 will NOT be met by 2020 (see pages 71 to 73 of Volume 2 of the new Air Quality Strategy published by the Department for Environment, Food and Rural Affairs (Defra)) and avoids showing equivalent information for PM10 (other than general non-compliance). We would be pleased to discuss this evidence with your officials. For the record, the carefully considered view of the Campaign for Clean Air in London is that the UK Government has not yet made reasonable efforts to meet EU Limit Values and has not made public how it plans to do so in future. 5. Maintain the Commission’s tough stance on the content of the proposed new Air Quality Directive to achieve better protection for Europe’s citizens. Accept, only if it looks as though MEPs from some countries may seek to weaken the new regime for everyone, that, very sadly, we may be better with the current muddled Air Quality regime of many Directives than a weakened new regime. Respectfully, if the Commission does not act in the way we are requesting it will raise serious concerns about the likelihood of successful enforcement action related to Air Pollution whether for Air Quality, carbon dioxide emissions for cars or in respect of Climate Change. Please set an example now that will reassure Europe’s citizens about their future. Please will your office acknowledge receipt of this letter to the sender’s email address? There is no need to reply formally to it – we would rather your officials were not distracted from the necessary enforcement action!